When it comes to property maintenance, the most important tasks can be found right over your head. Far from obvious disasters like floods or fires, roof damage is a slow burn. The only way to avoid costly repairs or replacements is through regular maintenance. That is why it is so important to have the right team in your corner. Our highly trained technicians can give you the results that you deserve with our Saskatoon roof cleaning and moss removal. From a street view, having debris on your roof can give an unappealing look to your property. Your property might be well-groomed and maintained at the ground level but if your roof is cluttered, it will be the first thing that guests or customers notice. Along with being visually unappealing, this clutter can mean big trouble for the condition of your roof as a whole. Plants are organics are able to grow because they are able to hold on to moisture. That is great for gardens and forests but plant growth on your property is just not good for you. Organic material grabs onto moisture and holds it against the surface of your roof. This moisture leads to rot and can lead to other plant growth – most notably, moss. Moss forms and spreads across hard surfaces like shingles. Instead of staying above these shingles, moss is known to spread underneath and pull these shingles away from the decking underneath. This leaves an open area, allowing moss to attack the outer layers of your roof and can even lead to holes and degradation. If your roof is in need of some maintenance, don’t hesitate to book an appointment for your Saskatoon roof cleaning and moss removal. Approaching a damaged roof is a delicate procedure. If your roof materials have been softened through exposure to moss, using the wrong tools can do more harm than good. 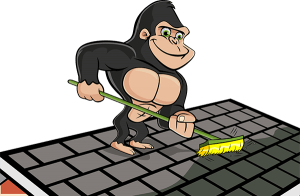 Our Gorilla technicians assess the condition of your property before beginning the process. This ensures that you get the best results for your space.